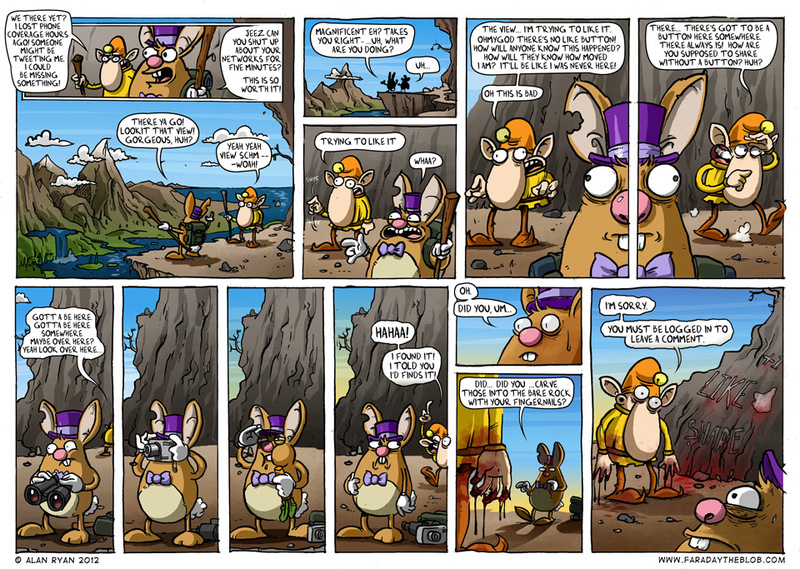 This entry was posted on Monday, October 1st, 2012 at 2:42 am and is filed under Comics. You can follow any responses to this entry through the RSS 2.0 feed. You can skip to the end and leave a response. Pinging is currently not allowed. Stunningly beautiful plus incredibly funny – just how I prefer my comics! The fact that you don’t actually have a like button… I honestly didn’t know what to do with myself for a second. DON’T LOOK AT ME. Haha! Intentional irony, or laziness? YOU decide! Great job, as always. Beautiful and horribly disturbing… like a lot of facebook, really. Jynksie - Haha – love button? Not the sort of thing you leave out on public view! Sick, sick, sick, funny, funny, sick, sick! Love button? Woooo. I love that! Says it all for our techie world!